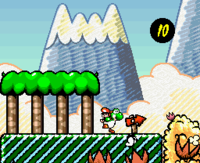 Welcome To Yoshi's Island is a level that can be played only once when a new game is started in Super Mario World 2: Yoshi's Island and its remake, Yoshi's Island: Super Mario Advance 3. It is mainly a tutorial in which Yoshi learns about Baby Mario, as well as using an Expansion Block and collecting coins. The level is very basic and short with no collectibles, with only few Shy-Guy enemies strolling around, making it easy enough for beginners. In the SNES version the player is given infinite lives for this level and thus cannot get a game over. In the GBA version, if a player gets a game over on this level and chooses to end, the file will say that the level is World 0. This level is also called World 0 if the player pauses during the level in the GBA version; it says "World 0" at the top, and at the bottom, it says the level is "World 0-0." As the level ends, Yoshi begins level 1-1, Make Eggs, Throw Eggs. The level is also used as the final section of Endless World of Yoshis, with the addition of Kamek attacking Yoshi every few seconds as in the first room of 6-8. French Voici l'île de Yoshi ! This is Yoshi's Island! German Jetzt Geht's Los! Here We Go! Yoshi's House at the start of the level. The very start of the level resembles Yoshi's House from Super Mario World. In the SNES version, this level can be skipped by pausing the game and pushing . 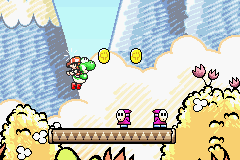 In the GBA version only, if the player has completed a level where Baby Mario is passed to a Yoshi that isn't Green Yoshi, then go back to the File Selection Screen by pressing (without soft-resetting) and starts a new file, the color of the Yoshi played on this first level will be of that color instead of Green Yoshi. This page was last edited on April 6, 2019, at 18:42.